Through community engagement and an emphasis on vulnerability, The Confess Project, an agency focused on education and awareness of mental health, and its CEO Lorenzo Lewis promote the importance of an unspoken taboo in communities of color — mental health. Lewis worked as a behavioral health professional before founding The Confess Project. Men of color particularly, Lewis said, often feel as though they are unable to express their emotions due to stereotypes that portray them as unfeeling, hypermasculine and violent. 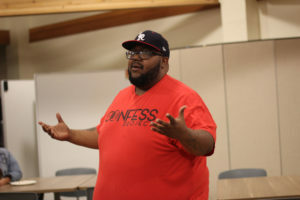 On April 11, The Office of Diversity, Equity and Inclusion, Oakes College, Oakes Senate, the African American Resources and Cultural Center and EOP hosted Lewis in the Oakes Learning Center to discuss his work with The Confess Project, and to spread awareness about the issues surrounding Black men in society. As a way to combat misguided stereotypes that portray men as unemotional, Lewis hopes to ignite change by creating a space for men of color to engage their emotions through discussions. At UC Santa Cruz, Lewis hopes to bring the model of The Confess Project to men of color to help them feel more comfortable expressing themselves. City on a Hill Press: What are the stigmas that you’re trying to combat and where do you think they come from? How does society condition the behavior of Black men? Lorenzo Lewis: I’m trying to combat the stigma of mental health within men of color […] because I feel that society feels [mental health] is only a white person’s issue and that people of color can only combat these issues on our own. […] There are accessible resources and services, whether they’re on campus or in communities, that can help. […] Spreading awareness is key [for] understanding how the stigma plays out and having the tools to live a healthy, holistic life. CHP: Why is promoting an awareness of mental health, especially for younger Black men, significant to the work you do? L.L. : It’s very significant because I feel that young black men need to see someone who looks like them promoting an awareness of mental health and pushing back against the idea that they are unemotional. Our mission is to inspire boys and men of color to be better emotionally. Young men seeing other men cry and express their emotions will inspire them to share their stories. CHP: What sort of impact do you hope to make on this campus and how do you think Black students might benefit from it? L.L. : Beginning to understand that we are better together, understanding the importance of unity on campus, and […] being able to raise awareness about campus resources that focus on mental health shines a light on the darkness. By addressing the inadequacies people of color face, this conversation is meant to highlight that while [Counseling and Psychological Services] and other on-campus services are doing great work, we have to move forward so that we can feel as though we are being paid attention to. CHP:Why is this event so important for Black men at UCSC? L.L. : I hope that Black men will continue to come together and have important conversations, and hopefully be able to go out and talk to other friends and allies and be able to say that it’s okay to go through these different emotional experiences because we are here to help and extend the network of support. Ultimately, I chose to come to UCSC […] to hone in on the importance of diversity and to remind folks that [mental health] is an important issue for the community. Even though only one person might be affected, each member of the community is impacted in one way or another.